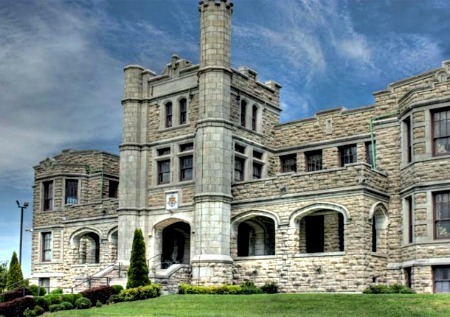 Pythian castle, as the building became to be known, was built in 1913 by a fraternity organization called the Knights of Pythian, with the official name of the building being Pythian home of Missouri. The buildings original purpose was to act as an orphanage and widows home for children and wives of members of the order, as well as general meeting hall. It served its purpose until the out break of world war two when the military commandeered it as a site to entertain and rehabilitate injured troops. The facility was quite luxurious, featuring a movie theater, ballroom, bowling alley, pool hall, library, and arts and crafts area. Many famous singers and performers of the day hosted shows here and the building served its purpose until the end of the war when it was used as reserve center, eventually being sold as surplus in 1993. The building is privately owned but reopened to the public in 2010 and hosts a number of functions, from weddings, proms and corporate parties as well as history tours, murder mystery dinners, and holiday events. The building is thought to be very active with paranormal activity and holds ghosts tours all year round. Why the building is haunted is unknown, as is the identities of the spirit's who manifest here. As with all haunted places there are many theories and local versions and camp fire stories which add pieces to it to sound more scary. The most popular stories of who may linger here comes from when the building was first occupied by the military. It is documented that German and Italian prisoners of war were kept here, but records say they were kept in a camp on the ground and not in the actual building itself. Whether at times prisoners were moved to the main building for whatever reason is unknown, but there are stories of them being kept in a dungeon area inside the building. It is within this room some prisoners are thought to have died in unpleasant circumstances and choose to linger in the form of sudden temperature drops and bright orbs on photos. The only problem is that which room, if any was used as the dungeon area since the drops and orbs can be captured across the whole building, but this story is likely to have been created to explain the phenomenon. There doesn't seem to be any particular hot spots in the building, with the activity being consistent through out. There is just as much chance for a door to slam shut on its own upstairs as there is in the hall. The buildings owner says her ghostly housemates are mostly friendly, but this hasn't stopped them scaring the hell out of many of the buildings guests. The building itself is a very impressive piece of architecture and worth a look around anyway, but if your looking for ghosts you should definitely book a place on one of their frequent ghost tours held through out the year.